Back in 1936, when women dared not have any desires and dreams to fly high in their life, it is hard to believe that some women did dare and flew high in the sky. Thus, the story of Sarla Thakral, who operated a Gypsy Moth solo in 1936 and that too wearing a Saree, seems almost impossible to swallow. Not only that, but she is also the first woman in Indian history to fly an aircraft. So, let us hear the forgotten tale of Sarla Thakral here. 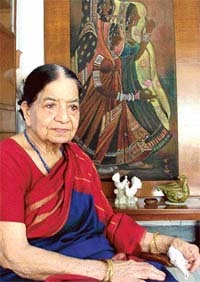 Born in 1914, the childhood of Sarla Thakral was spent in Delhi of undivided India. Just like any other girls back then, she also got married at the age of 16 to her husband P.D. Sharma. Luckily to her advantage, she got married to a progressive family where many family members had been a pilot by profession. Even her husband was the first man to get an airmail pilot’s license and flew between Karachi and Lahore. It was Mrs. Sarla’s dream to fly an aircraft, and all she had to do was to gather the courage to do it. After getting support from her husband and her father-in-law, Sarla started getting trained for her solo journey. In the meantime, she was blessed with a baby daughter. Finally, in the year of 1936 when she was only 21 years old, she got her aviation pilot license. Modestly dressed in Saree, Thakral flew a Gypsy moth solo from Lahore Flying Club. After the first ride, Sarla Thakral preserved and completed one thousand hours of flying in the aircraft owned by the Lahore Flying Club. According to her own words, she never faced any opposition from any outer society for her venture. And the history never forgot her name being the first woman in Indian history to fly an aircraft. Soon after her flight expedition, tragedy hit Mrs. Sarla’s life. Her husband died in a plane crash in 1939. After shaking off the initial shock, Sarla Thakral made her way to Jodhpur and applied for a commercial pilot’s license. But obstacles did not leave her. Soon, World War II broke out and all flying was suspended. With a broken heart, she returned to Lahore and started studying in Bengal school of Painting and obtained a diploma in fine arts. In the midst of women struggling their obstacles in daily lives, Mrs. Sarla Thakral sets the example of living a fearless life and giving wings to her dreams. Although she passed away in 2008, the forgotten tale of Sarla Thakral is something we will remember for generations after generation. She was a true gem who was honoured as the oldest yet the fittest person in her neighbourhood, even at the age of 91.